My 7th mission on the Catalunya Challenge was probably the most scary. Montserrat, translated sawed mountain because of its shape, is truly a masterpiece of Mother Nature. To get there I had to drive up a winding road all the way to the top where my jaw just dropped because of the sheer beauty in front of me. Now for my mission I had to 'Find the Elephant and scratch his head'. They were clearly referring to Elephant rock which you can hike to. That's what I thought I'd be doing, hiking. Now the thing is that the hiking trail to get to the top of Elephant Rock at some point just stops. The only way to get there is to go up the steep stone rock! You have to use hands and legs to kinda crawl up. I have to be honest and tell you that I got struck by fear right there and then. This raw feeling just takes over and makes it very hard to see things clear. I didn't want to give up though, not this close to the top so I pushed through and made my way to the very top. The sensation of conquering your fear really is incredible. Standing on top of this massive rock I was filled with a mix of emotions. I'll never forget this moment. I want to thank Ricard Fernandez Molinet, my guide for staying by my side and calmly advising me the entire time. Such a beautiful person! I'm happy to have shared this experience with him. 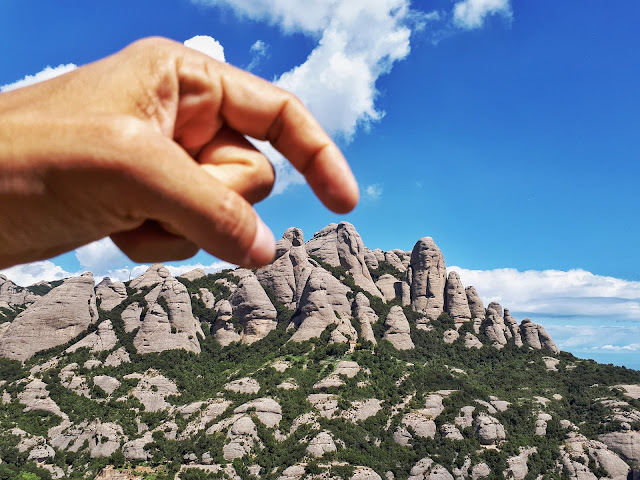 You can book him via Guies de Muntanya de Montserrat if you ever want to go for a hike in Montserrat with him as well.